I’m a little late to the party when it comes to roasted chickpeas. I’ve seen these all over the web for a couple of years and I am finally getting around making them for M.
I have to admit, I was pretty hesitant at first. Can chickpeas really get crunchy like a nut? Won’t it taste soggy? What convinced me was how healthy chickpeas are. Full of fiber & protein, it does sound like the perfect little snack for my bottomless pit of a daughter. First, you want to drain and rinse the chickpeas. Lay them out on a paper towel to dry out for about 20 minutes. Preheat the oven to 400 degrees. 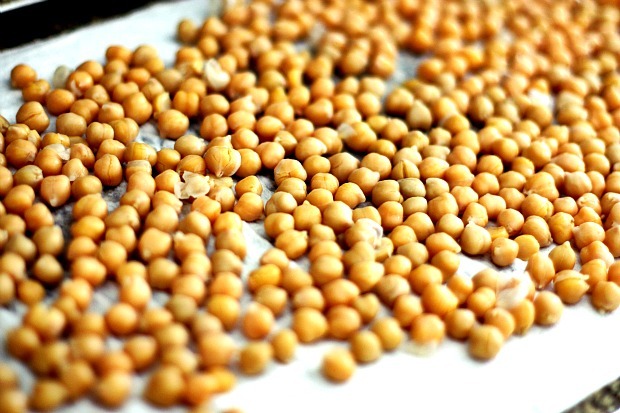 Lay the chickpeas out on a large baking pan so that they create a single layer. Toss with canola oil and 1 tablespoon honey. Bake for 40 minutes, stirring every 10 minutes. 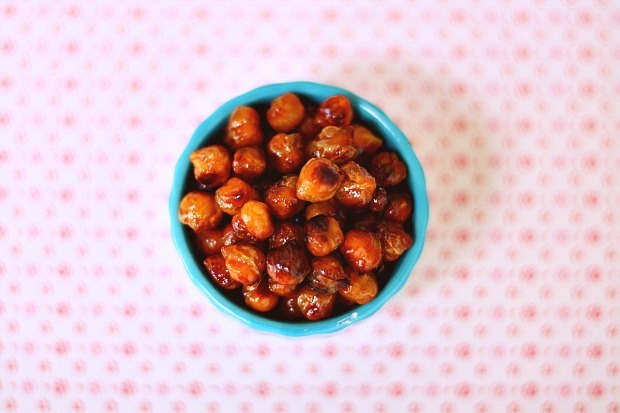 Once the chickpeas are browned, remove from the oven toss in 1 tablespoon honey and sprinkle with sea salt. Bake for 7-10 more minutes. Remove from the oven and let them cool completely. The longer they cool, the crispier they will get. I make these all the time but with savory spices. Love the honey idea! Thanks! I’m excited to try them with savory spices! Yours look wonderful! I’m dying to try them out! I haven’t tried roasting chickpeas yet but you may have just convinced me 🙂 Thanks for sharing! Oh my goodness, I have to try these! 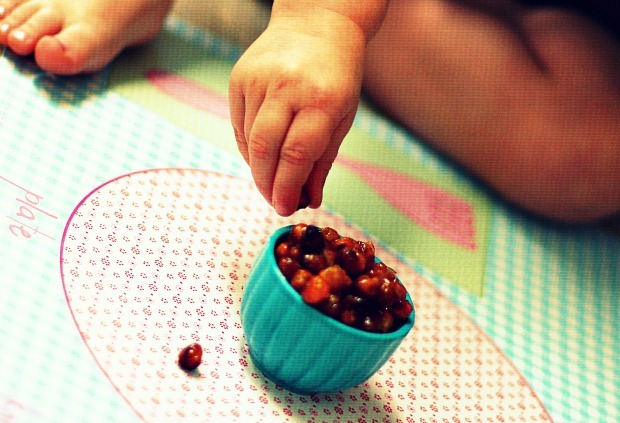 I LOVE garbanzos…what an awesome idea. I had never even heard of roasting them to make them all crunchy and even more delicious. With a nut allergy, I’m always looking for alternatives to nuts — these look like a great idea! 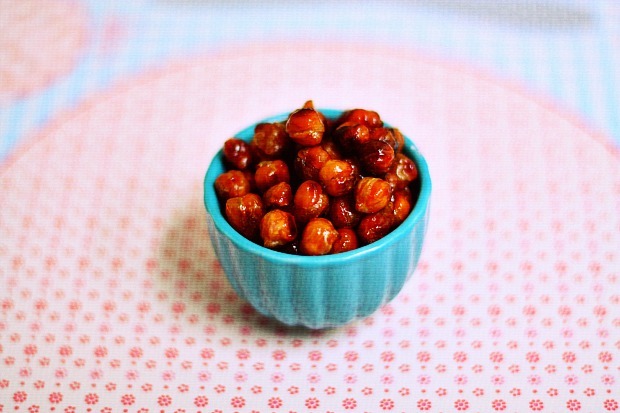 I made roasted chickpeas once and really enjoyed them, but I love that you did a sweet and salty version! Definitely trying this asap! I had to try them a few times, I never cooked them long enough to get crispy, but they are great! Love your sweet/salty twist! 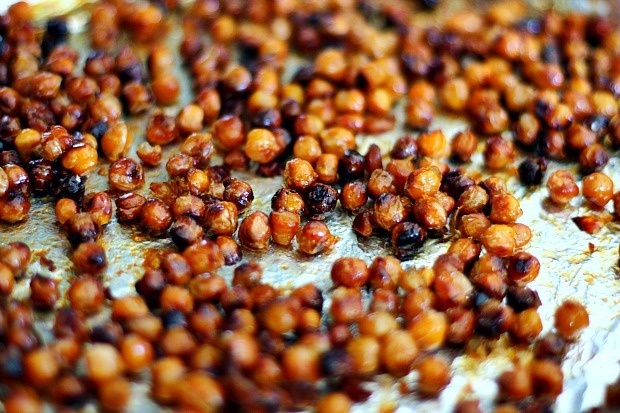 I have a couple recipes for roasted chickpeas…cinnamon sugar and peanut flour based. I love them and yours look perfect!! I lovvvvve roasted chickpeas!! I have to be careful with how addictive they are, haha! These sound delicious! A must-try for sure. 🙂 I like chickpeas, but I much prefer them roasted. Mmm! Chickpeas really are the answer to all culinary questions! Salty, sweet, soft, creamy, crispy…you name it, they can do it all! These look delicious! Estela! I want to eat these RIGHT NOW. I never even considered this for a snack! Wonderful!